Cape Scott Provincial Park is a truly magnificent area of rugged coastal wilderness that is located at the north-western tip of Vancouver Island, 563 kilometers from Victoria. Established in 1973 and named after the site of a lighthouse that has guided mariners since 1960, Cape Scott is characterized by more than 115 kilometers of scenic ocean frontage, including about 30 kilometers of spectacular remote beaches. 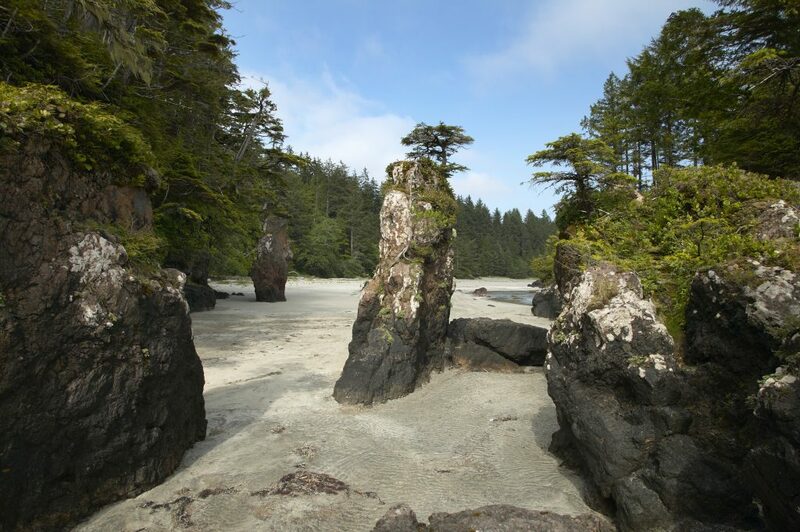 The park stretches from Shushartie Bay in the east, then westward around Cape Scott and south to San Josef Bay. Rocky promontories, salt marshes and jagged headlands punctuate the fine-textured, white-sand beaches. The most impressive of these beaches, Nels Bight, stretches more than 2,400 meters long and 210 meters wide at low tide, and is one of the Park’s most popular camping destinations. Other significant beaches include San Josef Bay, Guise Bay, Experiment Bight, Lowrie Bay and Nissen Bight. Visitors can choose between a day hike or a backpacking excursion to explore the sandy beaches, rainforests and lowland bogs and muskeg of this wilderness park.